July 2017 – Welcome to Wyandotte Daily! Voters will go to the polls Tuesday, Aug. 1, in Wyandotte County for the primary election for city, county and Board of Public Utilities positions. Unified Government mayor-CEO, Wyandotte County sheriff, Unified Government Commission districts 5, 7 and 8, and Board of Public Utilities, 1st District at large, are on the ballot on Tuesday. Polls will be open from 7 a.m. to 7 p.m. Voters should bring a driver’s license or other form of approved identification. These are all nonpartisan positions, and all registered voters may vote in the primary regardless of their party affiliation. For information on polling places, voting requirements and other election information, visit the Election Commissioner’s website at http://www.wycokck.org/Election.aspx or http://www.wycovotes.org/, or call the election office at 913-573-8500 or email election@wycokck.org. 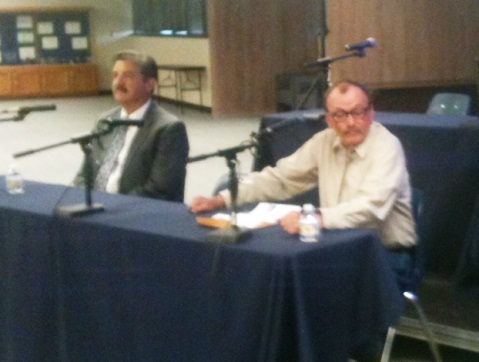 Three candidates are challenging incumbent Mary Gonzales for the Board of Public Utilities, 1st District at large contest. The three challengers are Kevin Braun, Bryan Messmer and Nikole C. Owens. 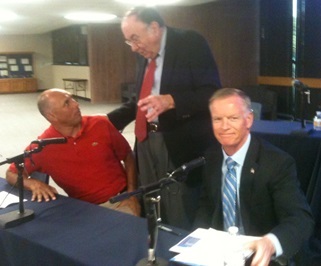 Braun attended the candidate forum July 19 at Kansas City Kansas Community College, and Gonzales sent a representative. The forum was on the same night as a BPU meeting. Messmer and Owens did not attend the forum. Braun, who also ran last year for state representative, 36th District, said he has been a Kansas City, Kansas, resident for 10 years and a Kansas resident for 20 years. Braun said he has a bachelor’s degree in business, and a master’s degree in business law. He served in the Army Reserves with two overseas deployments. He said all his experience, except military service, has been in the private sector. “I’m running for the BPU as a service to my community,” he said. He said affordability should be considered in everything the BPU does. He also is in favor of removing the PILOT (payment in lieu of taxes) from the BPU bill, because it is a city tax and does not fit on the BPU bill. Braun said he would vote against all rate increases on the BPU bills until reductions are considered. He also said he would only support green energy if it lowers the bill. He also said all fees should be in line with their true costs of the service it represents. In addition, Braun answered a question about the T-Bones’ bailout saying the free market had to handle it and the T-Bones had to sustain themselves. In addition, he said the underground utility lines along Leavenworth Road were not in the best interests of the community, because of the cost. It could have been done less expensive with poles, he said. Mary Gonzales, the incumbent, is a retired teacher who has a Bachelor of Arts degree from the University of Montevallo (Alabama), and a Master of Arts from Emporia University. She is a member of several community organizations. David Gonzales, speaking in behalf of his mother, Mary Gonzales, said she has worked tirelessly to make the utility the best it could be. Gonzales outlined these goals: Continue to partner with community leaders, business customers and others to support community goals and foster economic development; continue to update electric and water master plans to identify growth potential and mitigate aging infrastructure concerns; monitor and comply with legislative and environmental concerns; and the BPU must try to improve communications with customers. Gonzales said more than 500 BPU employees live in the community, are top givers in the United Way campaign and have raised more than a half-million dollars for children’s charities. Braun answered other questions, and more of the responses are on a video of the KCKCC forum July 19, posted online at https://www.youtube.com/watch?v=_i-ewSNPBNI. Incumbent Unified Government Commissioner Jim Walters faces two opponents for the UG Commission, 7th District. George Cooper, Bonner Springs, and Jim A. Gibson, Kansas City, Kansas, have also filed for the 7th District, UG Commission seat. At a candidate forum July 19 at Kansas City Kansas Community College, Walters, of Bonner Springs, said he is a native of Kansas City, Kansas, who moved to Edwardsville at age 12, and settled in Bonner Springs after getting married. He is an architect who has designed large sports stadiums around the world. “Working with cities around the country shows me how different cities have different visions for their future and what we can learn from them,” Walters said. His board service at work also has helped him with serving on the UG Commission. Cooper, a Bonner Springs City Council member, said he grew up in Kansas City, Kansas, then moved west. He is retired from the Board of Public Utilities. Wyandotte County is coming to a crossroads of great growth, with decisions to be made on which way to go, Cooper said. The biggest challenge in the 7th District, Walters said, is that county services are provided to the three cities in it, and city services are provided to the Kansas City, Kansas, portion. It also is made up of older housing and very new housing, he added. The biggest challenge is related to coordinating among the three cities the various utility requirements necessary for development to get those three cities who all have their own interests and visions, effectively communicating and working together, and being able to address issues that not only apply to new neighborhoods but also to mature neighborhoods, Walters said. Cooper said the biggest challenge he sees is the county portion of the mill levy. He believes that the 7th District doesn’t get a lot back from the county taxes. “The county services we get are nil,” he said. Bonner Springs and Edwardsville used to get funding for roads, he said. But that funding has gone away. They could really use some additional funding for roads, he added. When asked his position on bailing out the T-Bones, Walters said the T-Bones were a unique business, and municipalities and governments almost without exception support this type of entertainment. The UG Commission decided it was in the UG’s best economic interest to renegotiate the terms. He said the UG renegotiated some terms in the T-Bones’ favor and others in the UG’s favor. He said it was a business decision to keep the T-Bones thriving even though it may cost a little money, because the money was more than made up by the overall indirect economic impact. He said Village West continues to grow, and there is still a need to help small businesses in the community. He mentioned some programs available in Bonner Springs to help businesses. Walters said the challenge in the 7th District is the same as the other districts, to encourage good-paying jobs. When asked if commissioners should vote the same way as another commissioner who represents another district where a project is located, Walters said in general it would be appropriate, as the commissioners rely on the commissioner who represents a district to do the homework on individual items in their home districts. There are always exceptions, however, and if there is an issue where the home district commissioner is blinded to the bigger picture, it is important for the others to point it out, he added. Cooper said he is not a cookie-cutter and doesn’t always vote with the in-district commissioner. He said commissioners need to look at the big picture. “I’m going to get things done for people, every part of our city,” Cooper said. Walters said when he started on the commission, he volunteered for many sub-groups to learn about the UG. He was appointed to the board of directors of the Mid-America Regional Council, and then the Sustainable Places Policy Committee of MARC. It helps him understand what opportunities the community may have missed out on because it has not participated enough in the past, he said. The K-32 corridor study, for example, was a grant from MARC, and it was submitted by the three cities. That was a priority when he first ran, to get cooperation among the three cities, he noted. Gibson did not attend the KCKCC forum. Candidates answered other questions, and more of their responses are on a video of the KCKCC forum July 19, posted online at https://www.youtube.com/watch?v=OPjMFQSKF-8.